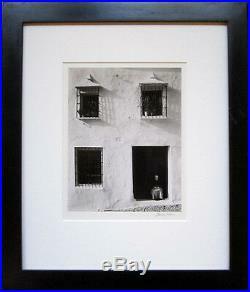 MORLEY BAER Signed 1958 Original Photograph - "House in Minas, Eyes Closed". 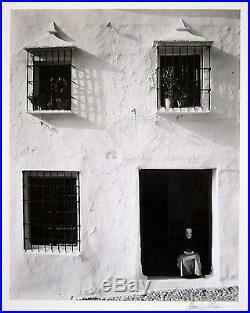 This rare original photograph is entitled "House in Minas, 1958, Eyes Closed", and is signed in pencil by the photographer on the front lower right of the mount "Morley Baer". It is in excellent condition, measures 7 ½" x 9 ½" and is matted and framed with glass for a total size of 16 ¼" x 19" (there are some scratches and wear to the frame). Estate of Mark Zaplin, Santa Fe, New Mexico. Mark Zaplin was a renowned gallery owner and collector of Edward S. Morley Baer was born in Toledo, Ohio. After earning his graduate degree in 1939 from the University of Michigan, he viewed a Chicago exhibition of Edward Weston and was inspired to make a pilgrimage to Carmel, California later than same year. Within the decade, Baer had settled in Carmel and working with his beloved 8 x10 Ansco view camera, became one of the greatest interpreters of the unique openness, light and form that imbues the California natural scene. He was featured in his first one-man museum show at the De Young Museum in San Francisco in 1959. Baer periodically assisted Edward Weston who eventually become a close personal friend, during Weston's final decade with Parkinson's until his death in 1958. In 1967, Baer became one of the original founders of Friends of Photography along with Ansel Adams and Brett Weston at Sunset Center in Carmel. Baer was also recognized during his lifetime as one of the finest architectural photographers in the world and in 1966, he received the distinguished National Award for Photography from the American Institute of Architects. In 1979, he became the very first photographer to ever receive the coveted Prix de Rome from the American Academy. Countless articles and books have featured Baer's photography, including his 1989 lifetime retrospective monograph entitled Light Years. Baer taught and mentored countless students of photography from his stone house near Garrapata Beach designed in 1965 by William Wurster before his death in 1995. 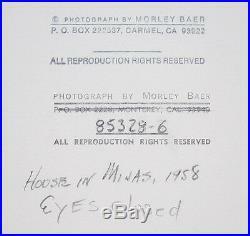 The item "MORLEY BAER Signed 1958 Original Photograph House in Minas, Eyes Closed" is in sale since Tuesday, January 5, 2016. This item is in the category "Art\Art Photographs". The seller is "skf-fineart" and is located in Los Angeles, California. This item can be shipped worldwide.